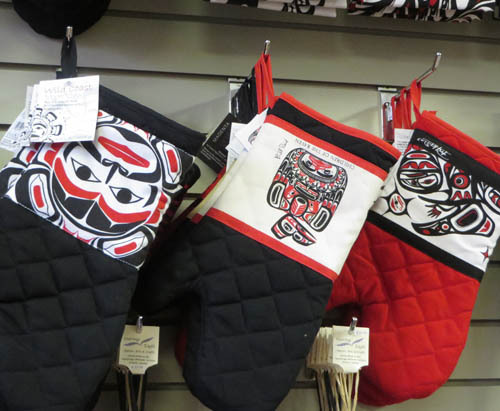 I’ve been going to the Native Canadian Christmas Craft Show for at least five years. Last Saturday, I noticed a welcome development from just the handmade jewellery, traditional porcupine quill baskets, and dream catchers that attract non-native buyers. 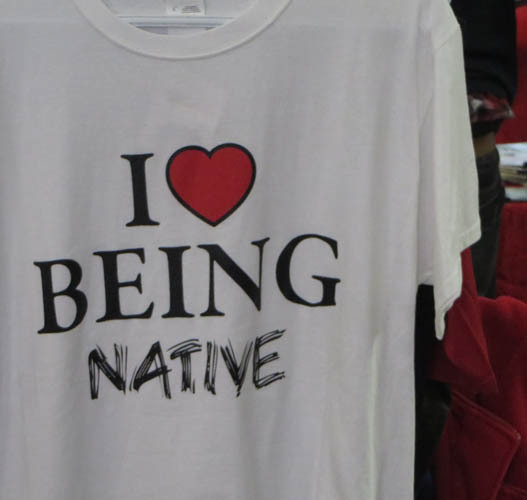 Many of the tee-shirts had strong messages of First Nations pride. I’ve also noticed more creativity in traditional crafts with new regalia designs, for example. Some were so personal, the artist would not let me photograph them because others might make copies. 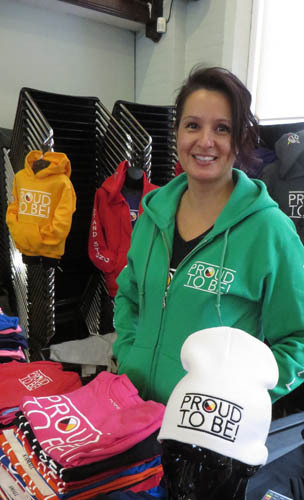 “Proud To Be” tee shirts, backpacks and toques were on sale. Their “Proud To Be” logo is a native medicine circle with the white, black, yellow and red triangles each representing the different races of humankind. “It’s an inclusive tee-shirt,” said Cher Obediah. I bought one for my grandson of course. He is part Chinese and part Finnish. Listening to videographer Cher explain the history of the shirt was fascinating. She said that the artist Earl Lambert was once a homeless drug and alcohol abuser, who decided to pull himself together. Today, he’s a motivational speaker and successful business man. See: www.earllambert.com. For shirts and video services, phone her at 226-388-1484. 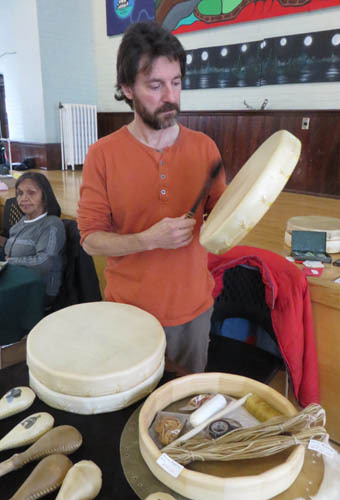 Also multicultural was Rick Monaco who makes African, Japanese as well as Aboriginal drums. www.rickmonaco.ca. 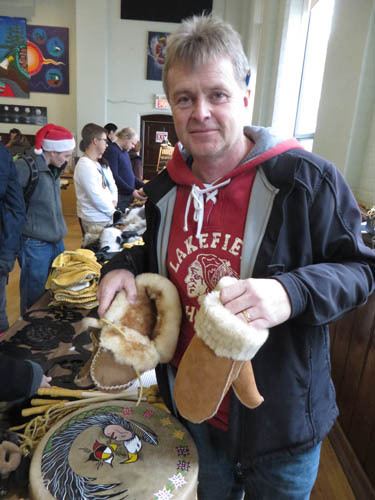 Karl Lech was offering sheep-skin gloves and slippers made by Aboriginal inmates of the medium-security Warkworth Institution in Campbellford, Ontario. An instructor, he teaches native crafts and techniques there. This pair of sheep-skin mittens for $40 are listed at least two or three times as much on the web or in stores. Contact him at Karl.lech@csc-scc.gc.ca. He said the prisoners are paid and proceeds go to developing his program of teaching native skills. 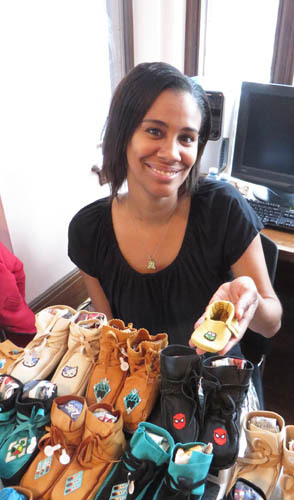 Natalie Sweeney was selling children’s moccasins that look like they won’t fall off. The smallest size was worn by her own baby. You can reach her at 416-857-6551. 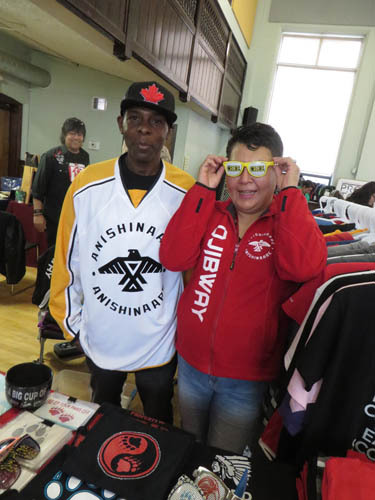 Andrade Foster and Markisa Cada were selling sunglasses, novelties and clothes with the names of different First Nations: www.markisaredcorner.com. 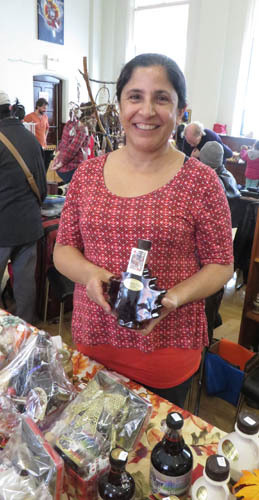 Deborah Aaron of Giizhigat Maple Products was offering candy, butter, and syrup, made from its own trees. Try her at giizhigat@gmail.com. The Christmas craft show is an annual event. If you are interested, please make a note of it on your 2016 calendar. Many thanks for very informative blog on where to give specifically, and where to purchase gifts. Hi Rita, Many thanks for taking the time to write. I think this influx of refugees will teach sponsors about the richness of Toronto’s many cultures and what is happening to their city.